Our today’s post on Online CPR Training Class Vs Conventional Classroom CPR Training is very important to understand as many of the training providers in market are offering online CPR training courses and they issue certificates to participants as well. First Aid to Save a Life Pakistan recommends such practices for informal learning, to create awareness, to engage students in practicing more and more; to encourage them while online practices on low risks involved if you do hands-only CPR etc. 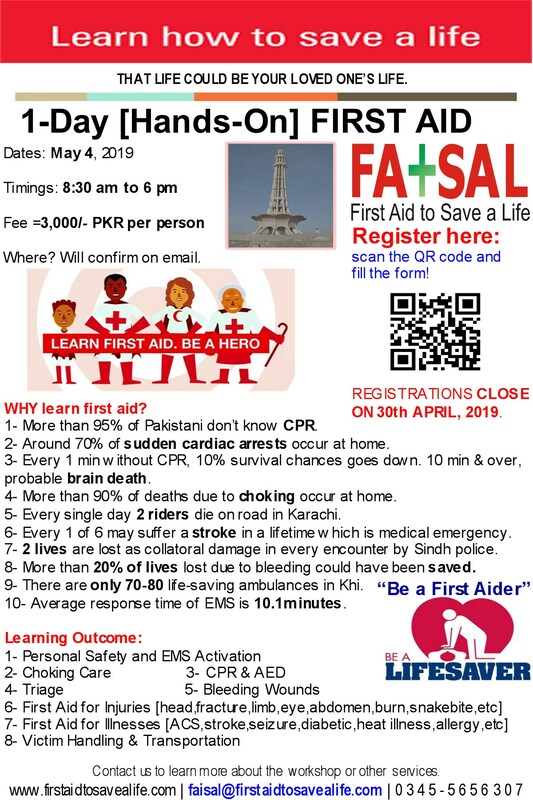 But First Aid to Save a Life Pakistan is not in favor of online CPR class and then certifies and issue certificates to participants as it is not recommended by American Heart Association. We at First Aid to Save a Life Pakistan have clear understanding of the matter and have given our words and commitment in our “Practical Skills and CPR Training” policy. Below are some of the extracts from our policy document on this issue. “It is the policy of First Aid to Save a Life Pakistan that CPR learning curriculum’s which ignore the importance of associated physical skills practice are not adequate to meet the reasonable performance measure and should be avoided. ………………………………………………… ……………………………………………………………………………………………………..
First Aid to Save a Life Pakistan also offers blended training courses but there is mandatory requirement that every student have to appear for practical (physical) skill assessment before authorized instructor and will get completion certificate only if he demonstrates correct use of life saving skills. Instructor will also allow them time and chances to clear their misunderstandings and re-appear there required to do so. With this we would like to quote here the extracts from American Heart Association’s latest guidelines released in October, 2010. American Heart Association further states in the below paragraph about the role of EMS in an emergency situation and transfer of instruction to untrained bystanders which unfortunately some of the training providers misunderstood and claiming that there is no harm in online CPR training classes which we and most of other training providers did not see in below paragraph. With above AHA also stated in their same document, “BLS skills can be learned equally well with practice while watching (video-based) training as through longer, traditional instructor-led courses”. Along with above AHA also recommends, “BLS courses should include periodic assessment of rescuer knowledge and skills with reinforcement provided as needed”. Now how one can pass on reinforcement feedback when two (trainee and instructor) of them are not present at one scene? How one can go for periodic assessment sessions? Etc. First Aid to Save a Life Pakistan wanted to clear misunderstanding in Pakistan on this issue and have posted this to answer all the misconceptions with references from latest guidelines released by AHA in October 2010. We will look forward to you for your words on online CPR class vs traditional CPR class and appreciate if you positively take part in our upcoming survey on this subject. This entry was posted in Advanced First Aid, Basic First Aid, CPR and AED, Effects of extreme temperature, First Aid, First Aid and CPR, First Aid CPR and AED, First Aid Training Programs, Industrial News, medicine information and tagged AHA recommendations on online CPR, American Heart Association guidelines on CPR training methodology, Blended CPR training program, class room CPR, conventional CPR training vs online CPR class, First Aid to Save a Life Pakistan blended trsining programs, online CPR training, practical skills and CPR training policy. Bookmark the permalink.